Advion Cockroach Gel Bait is a cockroach bait in the form of a gel, with a yellowish color, having as active substance indoxacarb, that blocks the operation of the central nerves of the pests. Advion Cockroach Gel Bait is made as an alternative to conventional insecticides to combat the main species of cockroaches. After monitoring the level of infestation, treat the area infested by applying the gel in "marbles" form, with special emphasis to places where the cockroaches are hiding: in the leak pipes area from kitchens and bathrooms, under and behind the roasters, refrigerators, washing machines, at the door's frame, in dark corners, where there are cracks in the wall or on the floor. - you can increase the number of drops up to 5 drops/m² under the conditions of powerful infestations, conditions of extreme dirt or in the case of Oriental and Americans cockroach majority. The gel can be applied in bait stations or in similar places. When it is applied outside, it must be protected against humidity or rain. At the end of the treatment the excess product is wiped with a napkin/paper towel and thrown into the dustbin. The gel is applied only in areas inaccessible for babies, children, pet animals and non-target organisms. The necessary time for the effect of biocides: 24-60 hours from ingestion. Advion Cockroach Gel Bait has in its composition food atractants which will attract the cockroaches to eat it within a range of a few meters: 24-60 hours after treatment the first dead cockroaches will be noticed,and, as far as possible, will have to be left on the spot. The cockroaches, by nature of their species, feed on their fellow excrements or other dead cockroaches. The treatment with Advion Cockroach Gel Bait uses this feature to generate a cascade effect: the live or the young born cockroaches, after the contaminated female cockroach hatches the eggs, will consume dead cockroaches, in addition to the gel and will die in a few days. 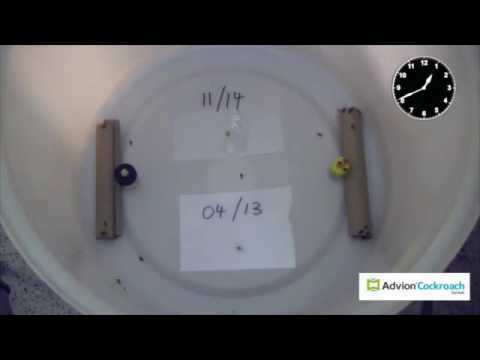 Advion Cockroach Gel Bait can be applied at any time of day, whether in the infested space are people or not, in hard-to-reach locations where liquid insecticides can not be used for security reasons. The syringe is easy to use and does not pose a risk to humans or pets. Persistence is up to 3 months, even in extreme temperatures and humidity.